Tink here. Right now, while no one is on the road and I’m spending most of my day in front of the computer, I’m getting by pretty easily in my home office with my ceramic mug and favorite plate. My tally of single-use plastics – my own particular focus – so far in Feb is 0. But I’m not bragging, that doesn’t count the fact that our dinner was leftovers (of ingredients originally packaged in plastic). 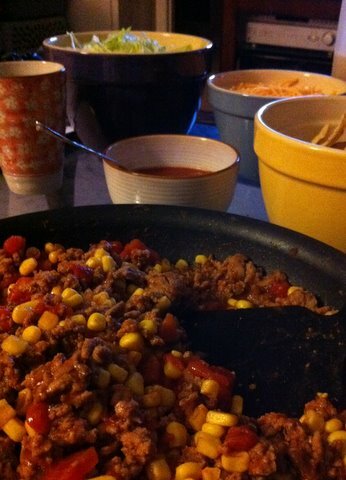 Jan 31: Doesn't this look like a lovely, plastics-free taco night? Scroll down for the truth. I also got lucky yesterday. No restaurants, no trips to Office Max. I already had my own ceramic “to-go” cup, so the coffee shop and meetings were no problem. At trivia night last night, I ordered a drink but asked the barkeep to use a real glass instead of the Styrofoam cup, and no plastic stir stick. Too easy. I’m getting off easy so far, I know, I know! But it’s only day 2 and I mostly work at home, so we have not really yet begun to get into it. Many of you are already way ahead of me on [growing and storing your own food], but earlier this week I was forced to take note that our taco night was basically brought to you by the sponsor Plastic. As far as plastics usage goes, overall, our leftovers last night were a bit of an undoing – since they had (on Jan 31) been put into plastic containers in the fridge. So because of #2 on Rodale’s three short rules, we took care to reheat them in ceramic bowls and not the plastic. Though wait till you see what those foods were packaged in, originally, at the store. I notice the teabags for the tea I’m drinking today are all wrapped in paper, yay. But the local honey I added was in a plastic squeeze bottle. The sploosh of milk I put in was from a plastic jug. For the milk, this particular local dairy does not do any other packaging, so I’ll need to make a decision the next time I buy: which is more important to me, the local organic low-pasteurization dairy, or the plastic. At the grocery store we have other organic milk options in cartons, though of course the pour spouts are plastic. For the honey, I should look to see if this particular honey (our favorite, and local) also comes in bulk or at least larger containers. I could also contact the company to find our whether I could take a clean glass jar to them for refill? Perhaps they have a retail location with bulk or fill-your-own honey? I recall something like this when I was a kid, going to the health food store with mom. I’ll let you know what I find out. My oatmeal this morning comes in a cardboard container but the lid is plastic. That’s not necessarily single-use, but I’m trying to become aware of it every time I touch plastic, and because our friends at Rodale are concerned with plastic in contact with food, I am noting it – even if I can’t fix it today. I can be aware of it next time I buy. 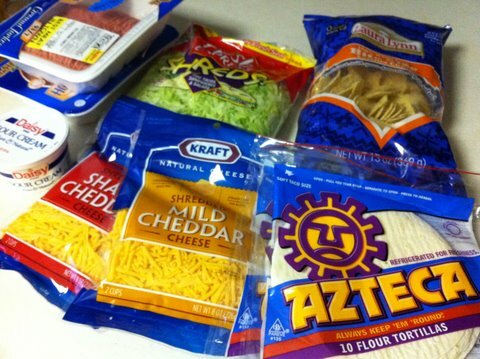 Monday's taco night was brought to you by the sponsor Plastic. Obviously it was all quick, store-bought items in convenience packaging. Short-term, I still expect my biggest obstacle to be the grocery store run later this week. I know that with a long-term plan, by growing and storing more of my own food, I will encounter less plastic at the store simply because I’ll be at the store less. Many of you are already way ahead of me on that, but earlier this week I was forced to take note that our taco night was basically brought to you by the sponsor Plastic. And as I’ve mentioned, there’s air travel towards the end of the month and that will be quite interesting! I hope by then I’ve learned a few tricks and can at least cut way down on my plastic use and waste. I think people don’t know about the single serving condiment packages. They do not decompose. I believe it is the same for capri sun drinks and the like; To me it is a huge problem in a small package. Any ideas? At the Whole Foods and other bulk foods stores in my area, you take your containers to the customer service desk first to have them weighed. They put a sticker on the container with the weight so it can be deducted when you leave. I guess the key is just to ask. Beth- I haven’t tried that at Whole Foods (mostly since I try to avoid Whole Foods), and unfortunately WF has managed to put all the other organic markets and coops out of business, so I can’t test whether they get around this somehow. But it’s good to hear that there are stores that let you do this. Hm. Thanks for the heads up, Xan… I am about to find out whether I can do it here in SC! I figure there are bulk bins, what difference does it make if I use their plastic baggie or my own glass babyfood jar? Though truthfully I’m not expecting it to work… how would I weigh it? Maybe if a deli person could weight my far before and after contents, and put a stickie label… Will let you know how it goes. Hi. Kudos for taking the challenge and realizing it’s not about being perfect but learning what is possible. Do you have stores in your area selling foods in bulk bins where you can bring your own bags and containers? You might find oatmeal or other cereals that way. Milk, sadly, is never plasticfree. It comes in a) a plastic container, b) a paperboard container coated with plastic (not wax, actually) and sometimes a plastic spout, or c) a glass bottle with a plastic cap. So don’t beat yourself up over it. Focus on the easiest changes first. And as for air travel, I actually just wrote about that subject this week! Thanks, Beth! Our little store does have some bulk bins, I’ll be sure to look to see if they have the steelcut oats that we like. My first Feb trip to the store will be this weekend, and I’m actually really looking forward to it. Your toothpaste pic reminded me to ask you about the prescription bottles. Have you seen any option anywhere to NOT get the little plastic pill bottle? Thanks for your input, direction, support and advice, Beth! I appreciate you stopping by on my post! It’s eye opening when you take inventory of it all. For the milk, have you asked them if you bring your own container in advance if they can fill it? They might be willing. Finding that balance of eco-friendly and keepin it local is always a challenge. Can’t be too rigid and do what works best for you. Either way you are doing something. I hadn’t thought of bringing my own container to the dairy, but I’ll call and see if that’s an option! Also, wonder if my self-cleaned glass jug will be as safe as their plastic jugs – I’m sure I’ll need to sterilize. Thanks, Mike! Do you drink milk? What are your options there in LA? I do not drink milk, but I have brought my own mason jars to juice bars, etc. Didn’t Michael Nolan or someone else say that they did something similar with their milk or did I read that somewhere else?